Art and Religion in the 21st Century takes a fresh approach to the connection between art and religion; it seeks to redefine their relationship in the contemporary age. 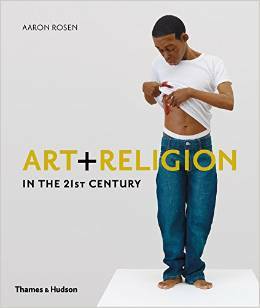 This book features work by 2 salon members, Tobi Kahn and Siona Benjamin; the Jewish Art Salon is honored to have its author, Aaron Rosen, PhD, serving on our Advisory Board. This exciting new publication is up on Amazon and available for pre-order here. Art & Religion in the 21st Century is the first in-depth study to survey an international roster of artists who use their work to explore religion’s cultural, social, political, and psychological impact on today’s world. An introduction outlines the debates and controversies that the art/religion connection has precipitated throughout history. Each of the book’s ten chapters introduces a theme—ideas of the Creation, the figure of Jesus, the sublime, wonder, diaspora and exile, religious and political conflict, ritual practice, mourning and monumentalizing, and spiritual “dwelling” in the body and in space—followed by a selection of works of art that illustrates that theme. Artists discussed include Vanessa Beecroft, Maurizio Cattelan, Makoto Fujimura, David LaChapelle, Annette Messager, Jason Rhoades, Andres Serrano, Siona Benjamin, Tobi Kahn and Zeng Fanzhi. 225 color illustrations. Rosen recently organized Love at the Jewish Museum in London, it first crowd-sourced exhibition.